It’s already been 5 years since DJ Rashad passed away. 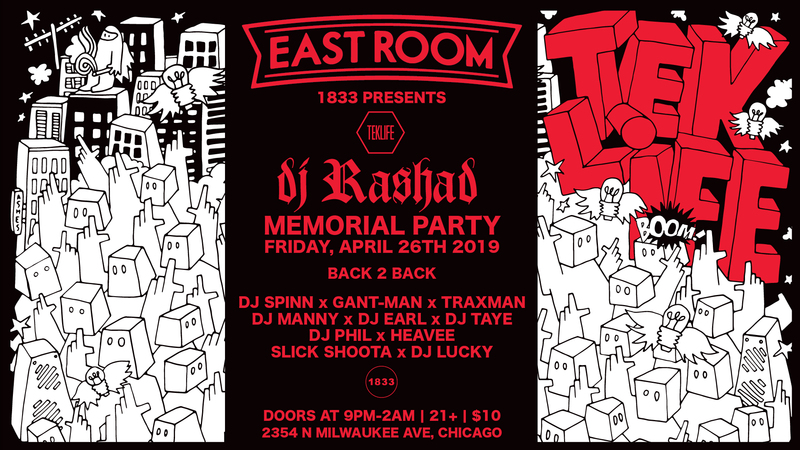 On Friday April 26th 2019, we are going to throw a memorial party for our friend at East Room in Chicago in collaboration with 1833. Most of the TEKLIFE crew will be there to commemorate Rashad’s music. All proceeds will go to Rashad’s family. Some photos of DJ RASHAD by ASHES57 will be displayed. The doors open at 9PM and the party will stop at 2 AM. Come early and hang out with us.